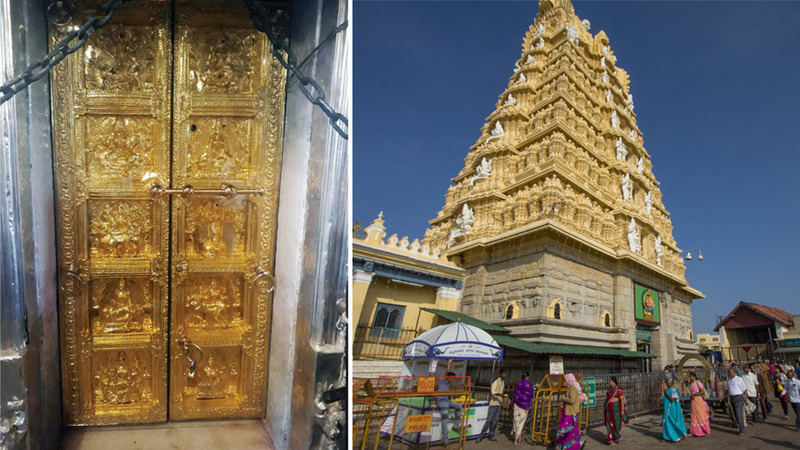 Mysuru: A Bengaluru-based devotee of Goddess Chamundeshwari has donated gold plating to the doors of the sanctum sanctorum of the temple atop Chamundi Hill here. Advocate Jayashree Sridhar, a resident of BTM Layout in Bengaluru, donated the gold plates worth Rs. 26 lakh for the silver doors of the Temple. The gold plating, with ‘Navadurga’ embossed on it, were fitted around 10 pm on Friday after darshan. Jayashree said that in 1987, when she started practicing Law, she decided to donate something to the presiding deity atop Chamundi Hill. “With the support of my family members, I have fulfilled my vow by offering gold plating to the doors of the sanctum sanctorum of Chamundeshwari,” she said.